It's finally December and that means that everyone is gearing up for the holidays. I'm so looking forward to the festive music, cozy drinks, and sparkly decorations and along with that comes beauty products that match the mood. As soon as it started getting properly chilly (mine from my November visit back home), I knew I had to bust out some of my favorite Christmassy colors again! What can I say, sparkly polish just feels right lately and NYX Las Vegas fits the season perfectly! I first gravitated toward this color since I didn't have many deep greens in my collection. Sometimes I feel like greens just don't look as nice on my yellow-toned skin, but every December I get the itch to wear a sparkly forest green and Las Vegas fills that void quite well. 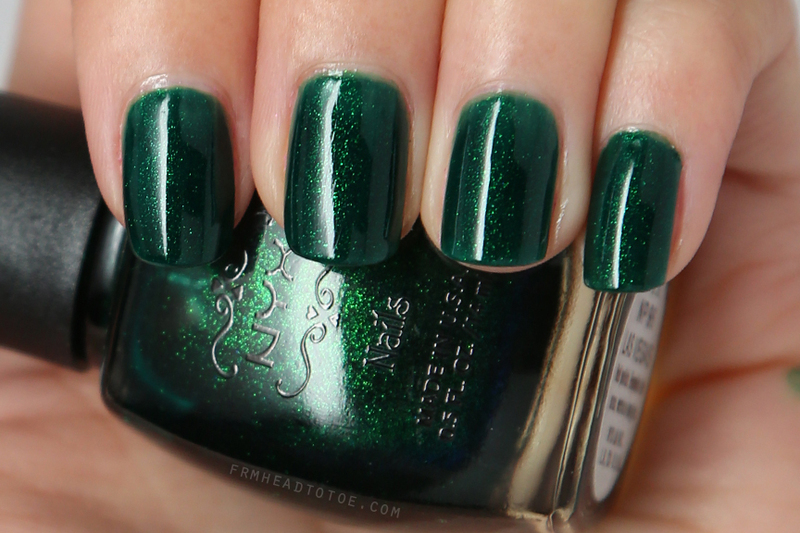 The color itself is a dark hunter green with a glass-fleck shimmer, imparting a sparkly but smooth finish. I used a base of CND Stickey Base with 4 coats of Las Vegas to get full opacity. Thick top coats like Seche Vite really seem to bring out the extra glossiness of these types of shimmer polishes and makes the shimmer pop. Aren't the blue edges of the bottle kind of beautiful? The polish wand reminds me of a baby version of OPI since it's flat but not as wide. In general this polish is easy to work with and gets a big bang for only being $3.50 when I purchased it at Cherry Culture. Sadly NYX has discontinued this line of polishes completely so you'll probably have to do some local hunting/google searching to find it. Are your nails reflecting the holidays? What colors are you coveting lately? Let me know in the comments! I don't have any deep greens either, and I'd certainly like this try this just because of the color. Looks so rich and stunning. It's the prettiest green polish I've seen! I've noticed your twitter feed isn't working, it happened on my blog too. I found a fix if you want to try (replace "[" for "<" and "]" for ">". Thank you so much and that's INCREDIBLE that you are enjoying it in Sweden! I love this color so much I kept looking at your nails on that "novemember favorite" video on youtube. Both of us me and my daughter like this color a lot, thanks Jen, happy Holiday.